About 12,000 years ago, the Laurentide Ice Sheet began to retreat from northern and southeastern Wisconsin. This ice sheet, which covered most of Canada and the northern United States, left its mark on Wisconsin, cutting moraines, kettles, drumlins, and rolling hills into the state’s landscape. This glacial retreat also created Wisconsin’s many ponds, lakes, rivers, and tributaries, most notably the Milwaukee River system. The Milwaukee River is an approximately 100-mile long waterway that stretches from Fond du Lac County to the Port of Milwaukee. About sixty miles northwest of the city, several tributaries converge to form the river near Campbellsport, and it heads east through the towns of Kewaskum, Barton, and West Bend, then veers in a zigzag fashion through the villages of Newberg, Waubeka, and Fredonia. The river, picking up speed as the Cedar Creek pours into it, then turns southward, passing through Saukville, Grafton, Thiensville, and Glendale. The river cuts through downtown Milwaukee, creating the boundary between the East and West sides. Continuing southward the Milwaukee River eventually joins the Menomonee and Kinnickinnic Rivers before reaching the Port of Milwaukee. The river’s history begins with the peoples who realized its vitality and used it to sustain their livelihood. For thousands of years, many Native American peoples—including the Chippewa, Sauk, Potawatomi, Winnebago, Menomonee, Ojibwe, and Ottawa—called the region home and built communities on or near the river. It provided an abundance of fish and attracted game such as deer and rabbits for hunters. The water also became crucial to farming, as most villages produced agricultural staples such as maize, beans, and squash that required irrigation systems. The river was a source of life, and Native Americans recognized its importance by respecting its bounty and power. It also served as a means of transportation and cultural transference, facilitating trade and diplomacy among local tribes. The Great Lakes and the tributaries of Wisconsin’s rivers later brought European explorers and missionaries into contact with these Indian communities in the seventeenth century. During their survey of the Mississippi River in 1673, Louis Joliet and Father Jacques Marquette confirmed other explorer testimonies that these were rich lands with potential for economic and spiritual growth. Fur traders regarded these communities as hubs of commercial activity and possible trade; Jesuit missionaries viewed Native Americans as souls to be saved and were determined to convert the Indian peoples to Christianity. Driven by demand in Europe, French fur traders began courting Indian villages for the coveted pelts. European empires later clashed for control of the region in the eighteenth century, and the English defeat of the French in the Seven Years’ War transformed relations between Indians and colonists. Native Americans faced a similar situation ten years later, when they were caught in the middle of a colonial rebellion between Americans and the British Crown. Neutrality was not an option, and for many tribes, American settlers were considered a greater immediate threat to their lands and way of life. While Indians fought on both sides during the American Revolution, the British exit from North America left Native Americans with little means of recourse or diplomatic leverage. Over time the federal and state governments used a variety of tactics to push Indians farther west. Many were misled or fooled into signing haphazard agreements. Some were given a fraction of the monetary value for their land, or received in exchange land that was worthless for hunting or farming. Those who resisted the encroachment and rejected these meager offers received an ultimatum to abandon their homes and march westward. Government policy dictated that Indians live on reservations, separated from white American settlers under the supervision of the Bureau of Indian Affairs. In an odd twist of events, the Milwaukee River became the catalyst that unified competing settlements into one city. In 1840, the territorial legislature of Wisconsin mandated the construction of a new bridge over the Milwaukee River. Solomon Juneau, the founder of the east side’s Juneautown, and Bryon Kilbourn, the financier and leader of the west side’s Kilbourntown, disputed the bridge’s construction. The rivalry between these two men was so intense that Kilbourn purposely laid out his city streets so that they would not correspond to Juneau’s; this is why many bridges over the Milwaukee River today run diagonally to connect the west and east sides of the city. In events now known as “The Bridge War,” Milwaukeeans rejected the idea of connecting the east and west communities. In May 1845, they responded to the bridge building with intermittent bouts of mob violence and bridge destruction. While there were no deaths, several people were seriously injured in the commotion. Both sides were appalled by the escalating violence and eventually agreed that a bridge would foster a greater sense of community and open up new economic opportunities. A year later, the completed bridge connected eastern and western Milwaukeeans. As the city developed into a major hub of Great Lakes commerce in the nineteenth century, the river became vital to Milwaukee’s booming industries. Milwaukee residents had a small brewing industry by the 1840s, but the arrival of German and Polish immigrants transformed the city into a brewing giant. By 1856, the city boasted twenty different breweries; four years later, there were over forty. The Miller, Schlitz, Blatz, and Pabst breweries dominated local and national markets. By the twentieth century, Milwaukee had become America’s brewing capital. The riverfront became a means to transport beer heading to ships in port and take in deliveries for local breweries. Frederick Pabst, the founder of the Pabst Brewing Company, even purchased a dock for the company on the river to expedite transactions and account for deliveries more efficiently for his brewery. The tanning industry also utilized the river for both leather production and shipping. Milwaukee became the natural choice for such a business, as many German immigrants were trained in tanning techniques. Additionally, Wisconsin’s vast hemlock and oak tree populations made the tanning process more economically feasible, as the technique required the natural tannins of these barks. The abundance of tree bark, coupled with lower operating costs, made Milwaukee a city of leather, surpassing Chicago’s production in the 1880s. These businesses were primarily located on the lower east side of the city along Water Street and the riverfront. One of these tanneries, the Pfister and Vogel Leather Company, employed over 600 men in three separate tanneries across the city. They, along with their competitors, took advantage of the river water for chemical production purposes and then sent finished leather products down river to the railroad depot and port for shipping. By 1890, the city of Milwaukee was the largest producer of plain leather hides in the world. Another major industry that capitalized on the river for access to markets was wheat production. Before becoming the dairy state, Wisconsin produced nearly one-sixth of the nation’s wheat between 1840 and 1880. The abundance of rural land and small startup costs made wheat farming attractive to new settlers and European immigrants. Farmers sent their wheat into the city for processing and packaging, often by wagon or by boat along the Milwaukee River. Grain mills sprouted up along the riverfront in the city, as mills used waterpower to process wheat into flour. Wisconsin wheat and flour were sent through the Great Lakes by carrier vessels and by rail, reaching major cities in the Midwest, South, and along the eastern seaboard. But gradually the overproduction of wheat contributed to the deterioration of Wisconsin soil. Coupled with various pest infestations and a harsh winter climate, farmers produced less and less wheat and thus less profit, forcing them to experiment with crop rotation and fertilizers. An increase in transportation costs also forced many producers into other agricultural pursuits, as Chicago supplanted Milwaukee for wheat distribution because of its superior railroad connections. The poor productivity of the soil forced many Wisconsin farmers to take up dairy farming, which today has become the state’s most recognizable agricultural industry. This transition in farming also helped to pollute the river, as animal waste and fertilizers used in the hinterlands found their way into the tributaries that flowed into the Milwaukee River. On the city’s south side near Walker’s Point, meatpacking plants sprung up along the Menomonee and Kinnickinnic Rivers. Milwaukee butchers Frederick Layton and John Plankinton, along with their competitors Thomas and Edward Roddis, dominated the hog and cattle industries, accounting for sixty to seventy percent of hog and ninety-five per cent of cattle production in 1859. The city’s proximity to rural farmlands, along with the hog’s natural ability to digest anything and gain weight, made pork its primary meat export. In the year 1871, Milwaukee produced the fourth most pork in meatpacking cites in the country. Upon his retirement from business, Plankinton’s firm was bought by the Irish immigrant Patrick Cudahy, who hadworked his way up through the Plankinton and Armour Meatpacking Company. Armour decided to part ways with Plankinton and Cudahy, opening new facilities in Chicago. Cudahy, recognizing that future city legislation might threaten the success of his newly acquired venture, opted to move the plant further south, establishing his own independent town of Cudahy just outside the municipality’s jurisdiction. Milwaukee’s meatpacking industries took advantage of their proximity to the river, using it to transport butchered products to ships in port while polluting its waters with animal wastes. Along with meatpacking plants, manufacturing and foundries also took root along the Milwaukee and Menomonee Rivers. In nearby Dodge County, the discovery of rich iron deposits transformed Milwaukee manufacturing. The number of manufactories in the city grew from 558 in 1860 to 2,879 thirty years later. The largest steel producer, the Milwaukee Iron Company in Bay View, opened its doors in 1870 and primarily made rails for America’s booming railroad expansion into the west. Steel also became the material of choice for local buildings, bridges, and ships. Milwaukee’s steel industry and proximity to the Great Lakes also stimulated the city’s shipbuilding industry. Steamboats, schooners, and tugboats were the vehicles of choice for river and lake travel, but after World War I, businesses such as the Manitowoc Shipbuilding Company were producing oil tankers, freighters, bulk carriers, and car ferries for greater transport. During the war alone the company produced 33 small seagoing cargo vessels known as “Lakers” to distribute materials to American allies in Europe. All of these industries relied heavily on the Milwaukee River as a means of production and a form of transportation. Milwaukee’s fast industrialization and urbanization in the late nineteenth century came with devastating environmental consequences for the river. It essentially became a dumping ground for tanners, brewers, mills, meatpacking plants, and manufactories. Coupled with Milwaukee’s fast-growing population, businesses and residents alike filled the river with industrial and human wastes. In 1888, city leaders constructed a water tunnel between Lake Michigan and the North Avenue Dam, using fresh lake water to flush the toxins from the river. This was a short-term solution, as the water only pushed the standing pollutants farther south, eventually reaching Lake Michigan and creating a larger environmental crisis. The city responded by building the Jones Island sewage treatment plant in 1925; this facility gradually improved the quality of the river water over the next few decades. Milwaukee also began separating storm and sanitary sewers underneath the city to prevent the accidental release of untreated waste into the river and lake. Prior to this, these sewers were shared for water runoff and sewage, and in times of heavy rain or flooding, these tunnels often overflowed and carried untreated human waste into the river, eventually reaching Lake Michigan. After the construction of the North Avenue Dam near the turn of the twentieth century, the river became more of a recreational hotspot, drawing countless locals to swim and sunbathe along the banks. One of the most frequented spots was Gordon Park, located at Humboldt Avenue and Locust Street. For Milwaukee’s urban residents, Gordon Park became a place to cool off during the blistering summer months. The park featured waterslides, diving boards, dressing rooms, and a permanent bathhouse. But even with municipal improvements in wastewater management, storm waters often overwhelmed the city’s sewers. Rainfall carried human sewage into the river and gradually polluted the Gordon Park beach. By the mid-1930s, Health Commissioner J.P. Koehler recommended closing the beach for the sake of public health. When Milwaukee County took possession of the park in 1937, they closed the beach but used federal money from the Works Progress Administration to build a brand new pool for city residents. For the first few decades of the twentieth century, the river served as a focal point for recreational activities and family outings, but city waste eventually chased these swimmers from its banks. 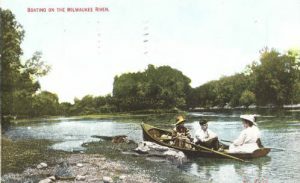 During the latter half of the twentieth century the river remained a public eyesore, a muddled and discolored body of water littered with floating debris. 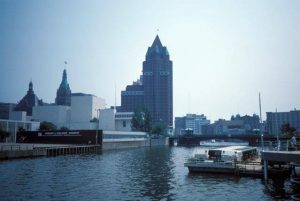 In 1988 Milwaukee Mayor John Norquist launched the Riverwalk Initiative, a government-sponsored program that planned to beautify the river to stimulate economic and real estate development in the downtown area. City officials reasoned that by improving the river’s condition and creating more access for residents, tourists, and businesses, the Milwaukee River could once again facilitate economic growth. Since the 1980s, the city has spent over five billion dollars to rehabilitate the river and purify its waters. Five years after Mayor Norquist’s proposal, the city authorized the construction of the RiverWalk, a system of elevated pathways and platforms alongside the river that connected various hotspots in downtown Milwaukee. Beginning in the Historic Third Ward, the RiverWalk stretches twenty blocks north, ending near Humboldt Avenue in the Beerline B neighborhood. The walkway passes attractions such as the Pabst Theater, the Milwaukee Repertory Theater, and the Marcus Center for the Performing Arts, along with Pere Marquette Park. Overlooking the river near the pathway’s intersection with Kilbourn Street is the “Bronze Fonz,” a statue of television character Arthur Fonzarelli from the popular sitcom “Happy Days.” The show was set in 1950s Milwaukee and ran from 1974-1984, becoming a television cult classic. The RiverWalk also runs parallel to Water Street, today considered the epicenter of Milwaukee’s nightlife. This street features a wide variety of restaurants, clubs, and bars and attracts both locals and visitors for a social night out on the town. 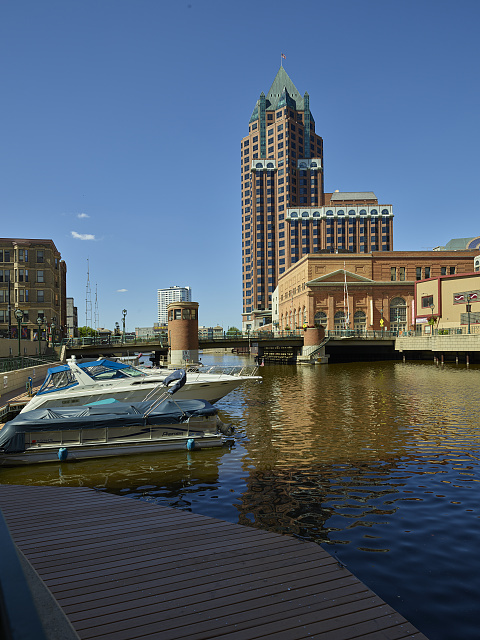 While the Milwaukee River historically served as the natural boundary between eastern and western Milwaukeeans, it continues to separate two distinct neighborhoods of the downtown area. The Lower East Side, located between the river and Lake Michigan, was once home to a bustling community of Italian and Polish immigrants. Glorioso’s Italian Market stands today as a testament to this past and remains a local favorite for fresh Italian cheeses, pasta, meats, and baked goods. In recent years the neighborhood has undergone an economic revitalization, offering residents an eclectic collection of coffee houses, restaurants, nightclubs, and vintage clothing outlets. Brady Street serves as the main thoroughfare of the community, and residents congregate at the street’s bars, restaurants, and festivals. On the other side of the river, the Riverwest neighborhood features a wide-variety of attractions, watering holes, and small businesses. Formerly a German and Polish neighborhood, the tradition of ethnic and racial diversity continues today as African-American, Asian, and Hispanic residents live amongst the student body of the University of Wisconsin-Milwaukee. This pluralism has transformed Riverwest into a community of volunteerism, an ethos that brings activists, city gardeners, and educational organizers together to improve the neighborhood. As a result Riverwest has its own residential association, newspaper, and food co-op. Working with local and national agencies, the community association recently completed the Beerline Trail, connecting the Riverwest neighborhood with downtown Milwaukee. This paved path offers easy access to the city and visitors a scenic path along the Milwaukee River. Today, the river serves as a locus of activity for both Milwaukee residents and tourists. A number of riverboat companies offer scenic tours of the city and “booze cruises,” which have become quite popular for work events, school and family reunions, and other large group gatherings. Riverwalk Boat Tours and Rentals even offer a city brewery tour via the Milwaukee River, dropping passengers off at Lakefront Brewery and Milwaukee Ale House. For individuals more interested in exercising during their sightseeing, the Milwaukee Kayak Company offers kayak, canoe, and standup paddleboard rentals for the river. The Urban Ecology Center also offers canoe and kayak rentals and gives discounts for members that join their organization with an annual membership fee. Local rowing teams, both collegiate and amateur, also use the river to train for regatta competitions. The Milwaukee River Challenge is an annual three-mile race that features over 900 male and female participants rowing on the city’s river. Much as it did during the city’s early settlement, the Milwaukee River continues to bring people together through a plethora of waterfront businesses, popular attractions, and outdoor activities, all of which give residents and visitors a greater appreciation of the city’s cultural heritage. ^ “Climate Change—The Long View,” Wisconsin Geological & Natural History Survey, accessed November 8, 2015. ^ “Geology Fieldnotes,” National Park Service, accessed November 8, 2015. ^ Carrie Trousil, “The Milwaukee River,” accessed September 16, 2015. ^ “Potawatomi History,” Milwaukee Public Museum, http://www.mpm.edu/wirp/icw-152.html, last accessed October 20, 2015. ^ “Arrival of the First Europeans,” Wisconsin Historical Society, accessed October 20, 2015. ^ Bill Marshall, ed., France and the Americas: Culture, Politics, and History (Santa Barbara, CA: ABC-CLIO Inc., 2005), 620-623. ^ Richard White, The Middle Ground: Indians, Empires, and Republics in the Great Lakes Region, 1650-1815 (New York: Cambridge University Press, 1991). ^ Colin Calloway, The American Revolution in Indian Country: Crisis and Diversity in Native American Communities (Cambridge, UK: Cambridge University Press, 1995). ^ For the most comprehensive overview of U.S. government-Indian relations, see Francis Paul Prucha, The Great Father: The United States Government and the American Indians (Lincoln, NE: University of Nebraska Press, 1984). ^ Virgil J. Vogel, Indian Names on Wisconsin’s Map (Madison, WI: University of Wisconsin Press, 1991), 134-135. For an online version of the treaty, see Indian Affairs: Laws and Treaties, ed. Charles J. Kappler (Washington D.C.: Government Printing Office, 1904), 2; 319, last accessed September 16, 2015. ^ Virgil J. Vogel, Indian Names on Wisconsin’s Map (Madison, WI: University of Wisconsin Press, 1991), 134-135. ^ Vogel, Indian Names on Wisconsin’s Map, 134-135. ^ Patty Loew, Indian Nations of Wisconsin: Histories of Endurance and Renewal, 2nd ed. (Madison, WI: Wisconsin Historical Press, 2013), 159. ^ “Milwaukee Timeline,” Milwaukee County Historical Society, accessed September 17, 2015. ^ “Early Milwaukee’s ‘Bridge War’ Halted by Incorporation in 1846,” The Milwaukee Journal, February 7, 1946, accessed September 17, 2015, https://news.google.com/newspapers?nid=1499&dat=19460207&id=ue4ZAAAAIBAJ&sjid=LSMEAAAAIBAJ&pg=2388,2676579&hl=en. ^ “Milwaukee’s History,” The Making of Milwaukee website, accessed September 17, 2015. ^ Martin Hintz, A Spirited History of Milwaukee: Brews & Booze (Charleston, SC: The History Press, 2011), 8-9. ^ Amy Mittelman, Brewing Battles: A History of American Beer (New York: Algora Publishing, 2008), 53-54. ^ Hintz, A Spirited History of Milwaukee: Brews & Booze, 28-30. ^ Robert C. Nesbit, Urbanization & Industrialization 1873-1893: History of Wisconsin (Stevens Point, WI: Worzalla Publishing Company, 1985), 3; 161-162. ^ Nesbit, Urbanization & Industrialization 1873-1893, 161-162. ^ “The Rise of Dairy Farming,” Wisconsin Historical Society, accessed September 17, 2015. ^ Robert Carrington Nesbit, Wisconsin: A History, 2nd ed. (Madison, WI: University of Wisconsin Press, 1989), , 272-275. ^ Harva Hatchten and Terese Allen, The Flavor of Wisconsin: An Informal History of Food and Eating in the Badger State, rev. ed. (Madison, WI: Wisconsin Historical Society Press, 2009), 78. ^ Hatchten and Allen, The Flavor of Wisconsin), 79. ^ Hatchten and Allen, The Flavor of Wisconsin, 78. ^ “Steel and Iron,” Milwaukee County Historical Society, accessed September 22, 2015. ^ “The Rise of Skilled Manufacturing,” Wisconsin Historical Society website, accessed September 22, 2015. ^ Wisconsin Maritime Museum, Maritime Manitowoc, 1847-1947 (Chicago, IL: Arcadia Publishing, 2006), 75. ^ Wisconsin Maritime Museum, Maritime Manitowoc, 75. ^ John Gurda, Cream City Chronicles: Stories of Milwaukee’s Past (Madison, WI: Wisconsin Historical Society Press, 2007), 74. ^ Gurda, Cream City Chronicles, 74. ^ United States Geological Survey, National Water Summary 1985—Hydrologic Events and Surface-Water Resources (Washington D.C: United States Government Printing Office, 1986), 491. ^ Chris Foran, “Summertime, and the Swimmin’ in the Milwaukee River Was Easy,” Milwaukee Journal Sentinel, July 14, 2015, accessed October 29, 2015. ^ “Riverwalk History,” accessed September 18, 2015. ^ Paul A. Smith, “$5 Billion Revival Leaves Milwaukee River Cleaner, More Valuable,” Milwaukee Journal Sentinel, June 7, 2014, accessed September 22, 2015. ^ Smith, “$5 Billion Revival Leaves Milwaukee River Cleaner, More Valuable,” accessed September 22, 2015. ^ “About the Riverwalk,” Visit Milwaukee, accessed September 18, 2015. ^ Carrie Trousil, “The Bronze Fonz: A Profile of Milwaukee’s Bronze Fonz,” accessed September 21, 2015. ^ “Our Store,” Glorioso’s Italian Market, accessed November 11, 2015. ^ “This Is Brady Street,” Brady Street Milw. WI, accessed November 11, 2015. ^ “The Neighborhood,” Riverwest Neighborhood Association, accessed November 11, 2015. ^ Karen Slattery, “I See the Future of Riverwest,” Urban Milwaukee, March 24, 2014, accessed November 11, 2015. ^ Jeramey Jannene, “Beerline Trail Open to the Public,” Urban Milwaukee, October 14, 2010, accessed November 11, 2015. ^ “Sunday 2 Brewery Tour,” RiverWalk Boat Tours, accessed September 21, 2015. ^ “Milwaukee Kayak Company,” Milwaukee Kayak Company LLC, accessed September 21, 2015. ^ “About Membership,” Urban Ecology Center, September 21, 2015. ^ “The Milwaukee River Challenge,” The Milwaukee River Challenge, accessed September 21, 2015. Gurda, John. Cream City Chronicles: Stories of Milwaukee’s Past. Madison, WI: Wisconsin Historical Society, 2007. Janik, Erika. A Short History of Wisconsin. Madison, WI: Wisconsin Historical Society Press, 2010. Nesbit, Robert Carrington. Wisconsin: A History. 2nd ed. Madison, WI: University of Wisconsin Press, 1989. Wisconsin Marine Historical Society. Maritime Milwaukee. Charleston, SC: Arcadia Publishing, 2011.